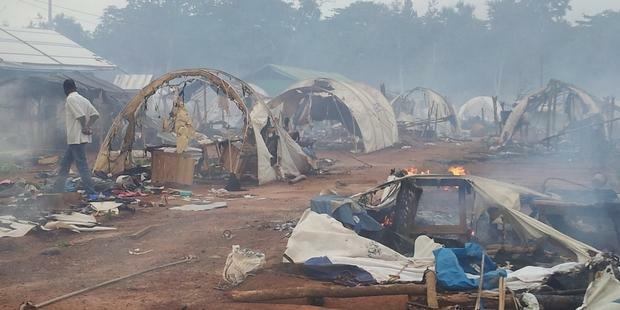 Nahibly Camp, in Cote d’Ivoire, a few hours after its destruction on 20 July 2012. A repressive cycle of widespread human rights violations by the armed forces pursuing former President Laurent Gbagbo’s supporters is making reconciliation in Côte d’Ivoire ever more elusive, Amnesty International said in a report released today. 26 February 2013 The national army, set up by President Alassane Ouattara in order to integrate forces loyal to the former President in the wake of the 2010 post-election violence which led to nearly 3,000 deaths, was supposed to ensure “the safety of person and property without distinction” and “be a powerful instrument for national cohesion”. But the truth behind this public gloss is that this new national army, along with an armed militia of traditional hunters – the Dozos – are carrying out extra-judicial executions, deliberate and arbitrary killings, politically motivated arrests and torture. They are acting with almost total impunity under the pretence of ensuring security and fighting against perpetrators of armed attacks. “Côte d’Ivoire needs to break the cycle of abuse and impunity. Not a single member of the national army or any other supporter of President Alassane Ouattara has been held to account for their actions, representing an absolute failure to establish the rule of law and severely undermining the reconciliation process set up in July 2011,” said Gaëtan Mootoo, Amnesty International’s West Africa researcher. In September and October 2012 an Amnesty International delegation visited a number of places of detention, including two unofficial ones. The delegates heard first hand testimonies about how detainees, largely held for their political or ethnic affiliations, are being held for months at a time, with no access to their families, lawyers or doctors. Some families only heard where their relatives were after being informed by the Amnesty International delegation. Detainees and former detainees explained how they were tortured with electricity or with molten plastic in order to extract confessions about their alleged participation in armed attacks. At least two of them died as a result of torture. The Amnesty International delegation was able to meet all of Laurent Gbagbo’s relatives and aides held in five detention centres in the centre and north of the country. Some of them have been subjected to inhumane and degrading treatment. One man told Amnesty International how he had been detained along with 27 other people in a 4 metre square cell with no sanitation for 49 days. Amnesty International has noted serious irregularities in the investigation of cases; the authorities have done very little to ensure fair hearings and have seriously undermined the right to a defence. The report also documents the attack and destruction in July 2012 of a camp of internally displaced people largely from the Guéré ethic group, generally regarded as Gbagbo supporters, which led to the death of at least 14 people – although many more bodies are believed to have been dumped in wells. The attack took place in Nahibly (near the town of Duékoué) in western Côte d’Ivoire, a region which has experienced some of the most serious human rights violations in the country. It was led by the Dozos – who are particularly active in the west – along with armed members of the local population and elements of the army. Noting the general failure of the authorities to ensure justice and reparation, Amnesty International is calling for an international commission of enquiry into this attack. The organization is also calling on the Ivorian authorities to halt the human rights violations and abuses which continue to be committed with impunity by state agents or militias supported by the state.